You can also find a complete online course, with videos of lectures, at http://virtual-sf.com/. 6 classic sci-fi films. Reading is important ... but so is VIEWING!!! I'll be adding more online sources you can access. Some of the following will be available through the Library shortly. You can find a huge list of books and articles at this US university's Library website. One of your key research tasks is to come to a clear, detailed definition of the genre ... but you will find that there are many opinions on this ... The above quote is a good starting point. 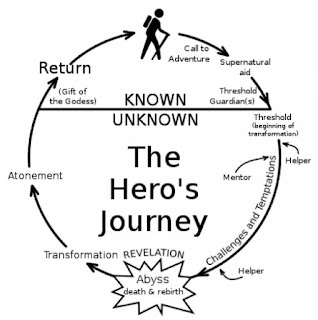 Start to consider which films provide examples of fitting this ... and any that might challenge it!!! 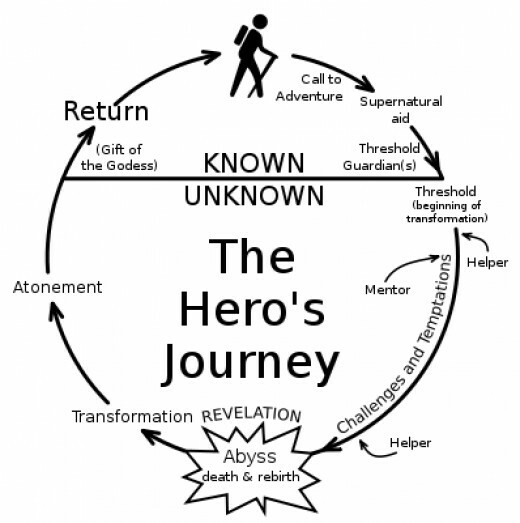 The monomyth ... see Carl the Critic link! BFI (British Film Institute) - detailed and not an easy read, but very useful. You will also find detailed reviews of many sci-fi films linked along the right. BBC: sci-fi is very hard to accurately define! Popmatters - problems with the genre and what you can learn from the film Moon. 3 reasons why sci-fi is the greatest genre. James May - loooong (but useful even if you only rad some of it) essay on the relationship between sci-fi literature and films. FirstShowing-net: Is sci-fi still changing? Is this a golden era? Jump Cut journal [complex!!] on sci-fi and other genres. Why the Dark Knight is really a sci-fi film. Guardian (UK quality newspaper) articles on sci-fi and fantasy. Latest sci-fi ranked by MetaCritic. How sci-fi film has evolved since 2000. Includes useful, fairly brief, comparisons of movies from different years. Why 2014 was a good year for sci-fi. Rolling Stone magazine's top 20 of the 21st century. TimeOut (UK magazine) expert panel pick top 100. Look to the right and you will see more useful articles. io9 - 50 everyone should see. SciFiFilmHistory - a dedicated site. 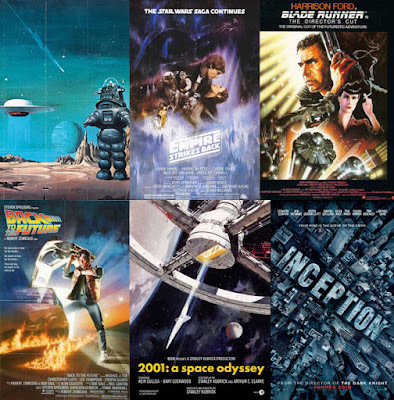 CinemaBlogography - how sci-fi grew to be a key film genre. Guardian: Soviet sci-fi you should see. There aren't many books that are pitched at GCSE level unfortunately! So, it is unlikely you would want to try reading much from the books below, but you could try a few chapters - including the introductions or conclusions, always useful to get key definitions and arguments! You can use googlebooks or Amazon's look inside tool to preview the writing style and have a look at the chapter titles or index: you could see if there is anything specifically on a film you are researching. I used the look inside tool to preview the writing, but also to directly access content that I can read as research without buying the book!!! Pocket Essentials Science Fiction Film - these are short, small (yes, pocket-sized!) books that avoid the academic jargon of many of the books below. The quality of the series is variable, and I don't (yet) have a copy of this one to judge for myself, but they are generally helpful and digestible, mixing chapters defining a genre with its history and case studies of specific films, directors, companies or eras. They are also out of print, so you would probably need to get a 2nd hand copy via eBay or Amazon UK (for example). Rickman [ed.] (2004) The Science Fiction Film Reader. This features short chapters written by filmmakers and industry insiders tracking the history of the genre and looking at some themes. This lavishly illustrated collection of essays begins with 'Cinematic Views', written between 1907 and 1929 by the great film pioneer Georges Melies. It goes on to explore the foundation of science fiction films in writings from the 20s and 30s by such masters of word and image as H G Wells, Luis Bunuel and Jorge Luis Borges. With the genre established and flourishing, the book moves in a variety of directions -- toward outer space, as a subject; different periods in film history, each with its own style and dominant themes; the work of specific directors and writers and, finally, some classic science fiction films of the recent past. Hochscherf et al. [eds.] (2011) British Science Fiction Film and Television: Critical essays. Written by international experts from a range of disciplines, these essays examine the uniquely British contribution to science fiction film and television. Viewing British SF as a cultural phenomenon that challenges straightforward definitions of genre, nationhood, authorship and media, the editors provide a conceptual introduction placing the essays within their critical context. Essay topics include Hammer science fiction films, the various incarnations of Doctor Who, Stanley Kubrick's A Clockwork Orange, and such 21st-century productions as 28 Days Later and Torchwood. This text attempts to shape definitions of the American science fiction film, studying the connection between the films and social preconceptions. It covers many classic films and discusses their import, seeking to rescue the genre from the neglect of film theorists. (Review) Sci-Fi Film as a Cult Text. Science Fiction Film examines one of the most enduring and popular genres of Hollywood cinema, suggesting how the science fiction film reflects attitudes toward science, technology, and reason as they have evolved in American culture over the course of the twentieth century. J. P. Telotte provides a survey of science fiction film criticism, emphasizing humanist, psychological, ideological, feminist, and postmodern critiques. He also sketches a history of the genre, from its earliest literary manifestations to the present, while touching on and comparing it to pulp fiction, early television science fiction, and Japanese animé. Telotte offers in-depth readings of three key films: Robocop, Close Encounters of the Third Kind, and THX 1138, each of which typifies a particular form of science fiction fantasy. Challenging the boundaries usually seen between high and low culture, literature and film, Science Fiction Film reasserts the central role of fantasy in popular films, even those concerned with reason, science, and technology. Bould (2012) Science Fiction (Routledge Film Guides) - use Amazon's 'look inside'. This major new study offers a broad historical and theoretical reassessment of the science fiction film genre. The book explores the development of science fiction in cinema from its beginnings in early film through to recent examples of the genre. Each chapter sets analyses of chosen films within a wider historical/cultural context, while concentrating on a specific thematic issue. The book therefore presents vital and unique perspectives in its approach to the genre, which include discussion of the relevance of psychedelic imagery, the 'new woman of science', generic performance and the prevalence of 'techno-orientalism' in recent films. While American films will be one of the principle areas covered, the author also engages with a range of pertinent examples from other nations, as well as discussing the centrality of science fiction as a transnational film genre. The films discussed include: "The Day the Earth Stood Still", "The Body Snatchers", "Forbidden Planet", "The Quatermass Experiment", "2001: A Space Odyssey", "Demon Seed", "Star Trek: The Motion Picture", "Star Wars", "Altered States", "Alien", "Blade Runner", "The Brother from Another Planet", "Back to the Future", "The Terminator", "Predator", "The One", "Dark City", "The Matrix", "Fifth Element" and "eXistenZ". Its key features are: it is thematically organised for use as a course text; it introduces current and past theories and practices, and provides an overview of the main themes, approaches and areas of study; covers new and burgeoning approaches such as generic performance and aspects of postmodern identity; and, includes new interviews with some of the main practitioners in the field: Roland Emmerich, Paul Verhoeven, Ken Russell, Stan Winston, William Gibson, Brian Aldiss, Joe Morton, Dean Norris and Billy Gray.